These brilliant 50th Birthday Cake Ideas! Even those of advancing years enjoy a nice slice of birthday cake. 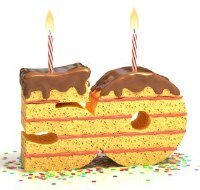 For those planning a 50th birthday party too arranging for, or baking a nice cake provides a great focus for part of the celebration. This is as true in an office full of co-workers as at home with family and friends. Its easy enough just to come up with a tried and tested birthday cake and then simply add candles in special 50 holders or arranged to spell 50. The cake can be in any flavour, and with any type of cream or icing you choose, or think that the party person will appreciate. You may however want to come up with something a bit special. Something related to the BIG 5 - 0. 50 is a funny age. A time for a bit of teasing perhaps and certainly a good opportunity for a bit of fun. This is simple enough you simply make 2 cakes in the shape of the numbers 5 and O. You can buy or hire tins in the shape of the numbers. Alternatively, and probably easier, bake 2 normal cakes and use card templates for the numbers which you then cut around. Rather than one cake, bake and decorate 50 small fairy or cup cakes. Icing and a candle on the top of each. Then arrange on a plate or in tiers. This sounds hard work but is often easier than doing a full blown cake. It also looks really impressive and makes it easy for everyone to have a piece of the birthday cake. A bit of gentle teasing as someone approaches their 6th decade? Make your cake in the shape of a hill or add a hilly hummock to the top of a flat cake before icing in green. Little figures etc can add a cute touch. Ice the words "Over The Hill" somewhere. This could take the form of "50 Not Out" from the English game of cricket. Alternatively 50 (yds mark) could be prominently marked on a cake that resembles an American Football pitch. The Bullseye in darts is worth 50 too - could you come up with an idea around that? This is a plain and simple cake but you just make a point of having a full fifty candles on top. Cluster them together so they look even more impressive. You now have plenty of opportunities for teasing. Make a big show of positioning fire buckets / extinguishers etc around in advance. You could also have fun with some of that tape used by police and others to keep crowds at a safe distance etc. Here is another tease about getting on in years. In the UK small sweets called Werther's Originals are the renowned favourites of senior citizens. Other countries also have similar sweets associated with those of advancing years. Use them to decorate your cake in the way children's cakes are decorated with Smarties / M & Ms.
Do you have any good 50th Birthday Cake Ideas? Or have you got a photo of a classic? Send them in to us and we will add them to this page.